PDF above is the full story I wrote (with pictures) after the voyage. For a shorter version covering the Journey in the Dark across Tom's Cove, and why I'll never laugh at lighthouses again, scroll down. Below, a few other inspirational lighthouses I have known. Mak-eh-nuk is a northwest coast (Kwakiutl) word for orca, in some legends, the whale folk take off their fins to walk on land in human form, the fin becomes a boat. The Chesapeake Bay with its twisting, narrow waterways, shifting sandy shoals required a few lighthouses. A lot of lighthouses. Most were fairly short, not the 141' of the Assateague Light (on a barrier island off the coast). The flat landscape of the Bay required shorter lights. Many were screwpiles, little hexagonal or octagonal houses on legs (screwed into the bay floor) with a light on top. At least one, Seven Foot Knoll, in Baltimore MD, is round... and bright red. I've had the honor of photographing these local lights in the dark, many times from boats, like Schooner Sultana, on which we passed the Thomas Point Light, still in the middle of the Bay, and ended the voyage at the Hooper Strait Light on St. Michaels. I've used the Turkey Point Light as a marker for a few kayak voyages. The Assateague Light is still my favorite, the one that guided me on more than one voyage in the dark. Pics at the bottom of the page. That PDF version was written in 2002, after the voyage in July. (which required at least one PFD, or Personal Flotation Device) Peter Jackson's film version of my favorite bit of literature, Lord of the Rings, had just happened, the first part of the trilogy premiered in winter of 2001. My dad died (at 87) between that first part of the trilogy and the voyage. This is important to know because it will explain why I did a nearly 40 mile solo paddle in the first place (a sort of hero journey of my own to mark the passing of someone who'd first brought me to the island... while he stayed as far from the water as possible), why there was a plush black Labrador Retriever puppy lashed to the deck bungees (she had accompanied my dad in the hospital and resembled his dog, Sage, a refuge from the SPCA), and a Legolas action figure as a "figurehead" on the kayak's bow (his arrow shooting pose made him look like he was navigating me into the unknown, or perhaps to New Zealand). Also why the entire story (in the PDF version) is basically one giant Middle Earth pun. It is also loaded with fun photos from that Chincoteague trip, though I didn't take any night shots (Photoshop is my friend). 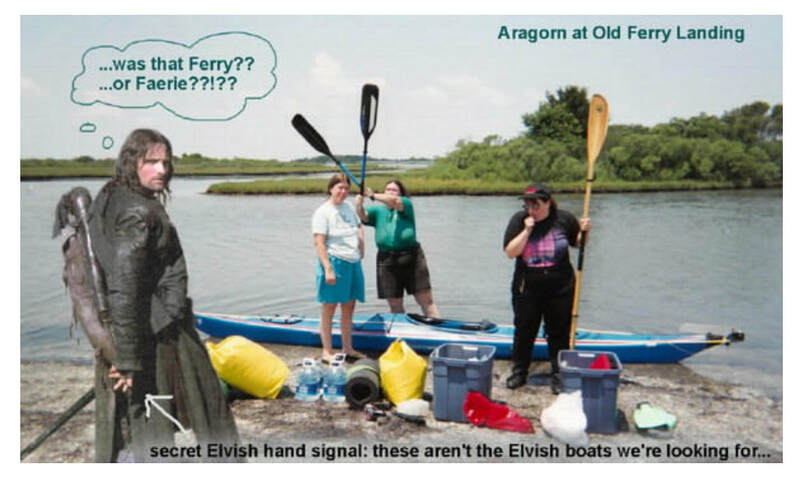 Photoshop also allowed the Hobbits, one Ranger, and an Elf to accompany my voyage. It is the third sea voyage because Mak-eh-nuk's Fin had already been in saltwater twice... just not for quite as long or as far. Meanwhile, in the present, a particular church service asked us to share our stories of spirituality and what it means...in one minute. Totally inadequate, I love Epic Storytelling. Somehow I managed to spit out the basic idea. We are Unitarian Universalists so Meaning is rather like a barrier island... shifting under wind and wave, but always, somehow, constant in its relationship to the rest of the ocean and the land beyond. Grandpa Beebe, in Marguerite Henry's "Misty of Chincoteague, says something like; "facts are fine as far as they go, they're like water bugs skittering across the surface, but stories go down deep..." Grandpa Beebe was a real person, but it might be Marguerite Henry who really said that. Any way, it's one of my Meaningful Truths. I first heard about Assateague because of a pony; Marguerite Henry's Misty of Chincoteague, a fictionalized version of real people, places and events that took place on a barrier island off the coast of Virginia. I first went there in 1972. I had shown my dad another Marguerite Henry book, Album of Horses, and its page on the Chincoteague Pony. "We should go there." he said. "You mean it's a real place?" We went, for Pony Penning. My two friends and I dragged my dad to the beach, where he walked up and down the sand in his jeans and work boots and long sleeved chambray shirt rolled up to the elbows as far from the sea as possible. We frolicked in the waves, ran under the full moon, and met Misty herself at the little stable in the center of Chincoteague town. I never took a picture, because she was snoozing, and I didn't want to disturb her. She died that October. I came back, over and over, with 4x4, with backpack, with tent, with cats, with dogs, to stay in my friend's cottage, for Pony Penning, and in other seasons. Then I found kayaking and found a whole 'nother side to the islands. In early 2002 my dad died at 87... not a bad run. The wiggly vague changing line where the shore meets the sea has been my go to place for "quests", "hero journeys" and times when I need to turn off the squirrel brain and meditate. I have hiked with a fifty pound backpack into the backcountry and spent days not talking or seeing anyone. Meeting someone on the beach on the way back was like meeting the only other person on the planet... and finding your voice again after a few days was weird...just weird. 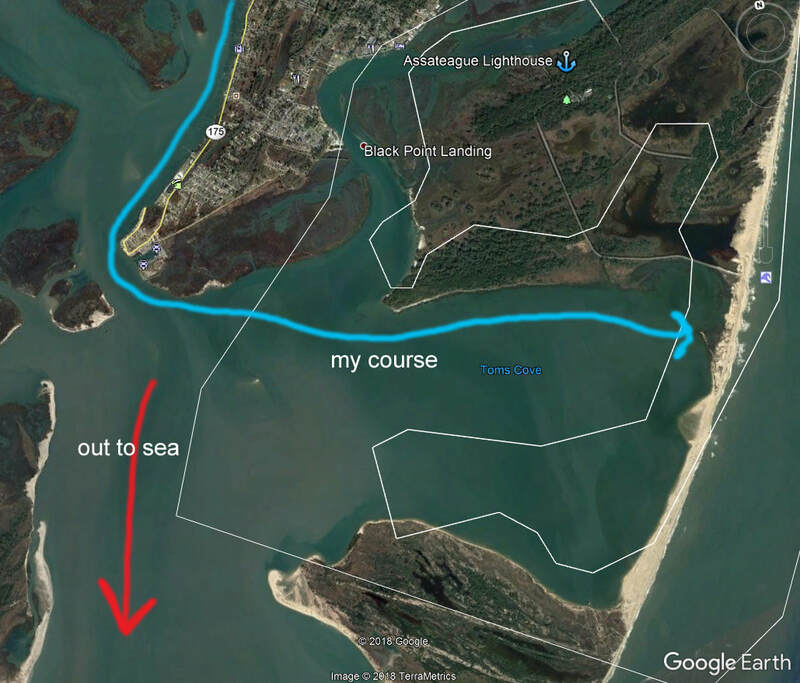 ​I had no cell phone... they weren't ubiquitous yet...a 'yak full of Everything I Could Possibly Need (it was downright decadent compared to a backpack), and friends staying on Chincoteague who would call the Coast Guard if I didn't show up by Wednesday morning. 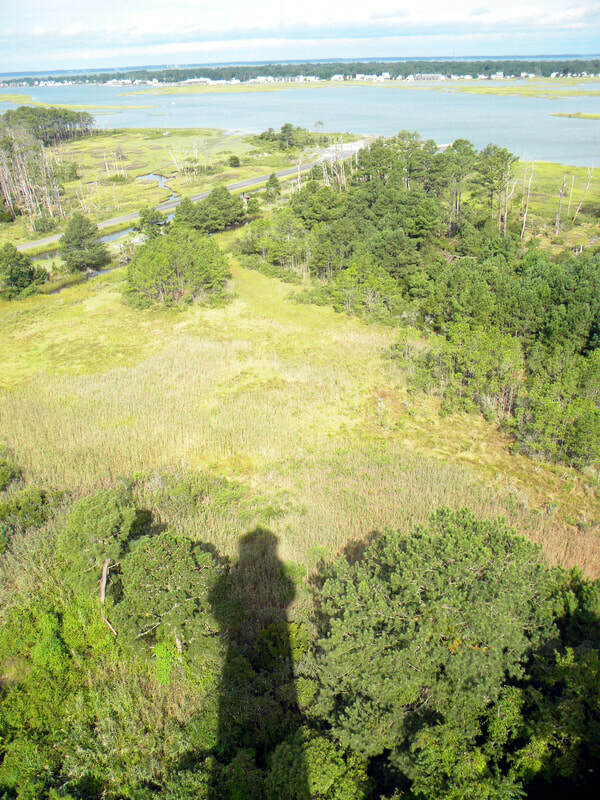 Finding me would be easy, I would be following the puzzle of marsh and shallow bay water on the west side of the long barrier island of Assateague. I had weather reports (good), maps (eh, charts if you're on the water), tide tables. stepped on a stingray... don't... you shuffle your feet in shallow murky water. There's a place on the Chesapeake Bay where Captain John Smith (the Pocahontas guy) felt the need to poke a stingray with his sword and got stabbed in return, he fell so ill he told his men to dig his grave, but recovered in time to eat the stingray for supper. I got the backcountry permit ($5, nobody wants to battle the hordes of bloodsucking vampires) left my truck in Tom's Cove, perched the 17.5 foot 'yak on the roof of my friends' hugemongous white van (why isn't there a ladder in this house???) and drove to Ferry Landing on the north end of the island, in Maryland. My voyage would cross parts of two states in two days. Based on my earlier voyages in the Chesapeake Bay, I should be back Tuesday afternoon... evening at the latest. If you don't see me by Wednesday, call the Coast Guard. Most of it fits. I have the basics of survival; gorp and duct tape and a spare paddle. I am swathed in a superhero suit of spandex (my diveskin) which is 100 proof sunscreen that won't wash off or require reapplication when I am wet and sandy. I have a tent, 100% DEET (those vampires include dozens of kinds of bloodsucking flies, mosquitoes and three kinds of ticks) and a wool cloak... because it is mosquito proof, warm when wet, and you should always journey with a cloak. I have a lot of other stuff that makes the boat sink a bit lower in the water than normal. I set out, and discover One Last Thing; a plastic box that simply Does Not Fit. I wiggle it into several useless spaces, then give it to the first crabbers I see. 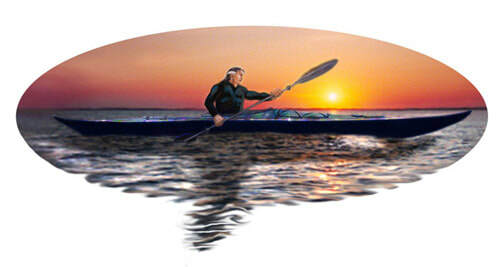 ...the rhythm of the waves and the stroke of the paddle, like flight, the heartbeat of the Journey. Seabirds wail and wheel, mysterious flashes of fins from below, a ripple of something unseen, the constant wind in your face. Spray. A nap on a sandbar, the boat securly anchored. Drifting with the tide in mask and snorkel, hand tied to the boat's line, snoozing like a dolphin, half your brain awake. Searching for the campsite's sign in the near-dark, finally seeing a flash of white among the puzzle pieces of marsh grass and water. Is it an egret? Or the sign. Paddling to it and up a maze of tiny water to a crumbling dock, an ancient brick building, and one incongruous electric pole. Throwing on the wool cloak and the DEET and swatting off the vampiric hordes as you race to tie up the boat and secure the camp. Burning sage because the old fish factory is truly creepy (and this was the setting for a kids' book called The Haunted Lagoon). The presence of a huge "stallion pile" where wild ponies have left their calling cards is comforting... yeah, horse poop, comforting. Tai chi in the morning in shallow water because doing it on land is too buggy. Back in the boat. Paddle. ...and a more difficult entrance into Tom's Cove. Going under the bridge, I meet a speedboat going the other way and wonder if its wake (usually not a problem) will just dump me. I pass the marshes behind summer cottages and consider mucking across them to the Green Heron where my friends are staying. I keep paddling. I could haul out at the Town Dock, hike to my friends' place (and hope nobody took my stuff), and get rescued. I am THIS CLOSE... I keep paddling. I reach the end of Chincoteague town and see someone on a dock. I shout up, "Is this the way into Tom's Cove?" He yells back, "Sure! Tide's goin' out, you might make it." My tide charts are wrong. I have wind waves coming from one direction, tide waves coming from another, and all of it bouncing off the marshy mudwall to the east. Kayakers call this clapotis, which sounds like a not so fun disease and it isn't. Exhausted, waves going every which way, I hug the shore and eyeball where I can swim/drag the boat to if I get dumped. The Fin stays steady and we shoot out of the clapotis into fairly calm water. I've rounded "the horn" and haul aground on a shoal. I get out, take stock of the sinking sun behind me, and the stretch of Tom's Cove in front of me to the east. It is a good four miles across the cove to where my truck is parked. I had already come about 26 miles as the fish crow flies, more if you count the wobbly shape of the marshy inner shore of the island, even as I paddled more or less straight from headland to headland. I am standing on ribbed mussels. Ribbed mussels, close relatives of those ones on your plate, grow underwater. In the shifting tides and changing shapes of barrier islands, this land would soon become sea. I got back in the boat and paddled. But not before eyeing the far shore and setting a compass course. I am slightly dyslexic and constantly confuse left and right. I can, however, read a map; it's a picture, as if you were a bird flying over the land. Four directions on a compass rose make sense too. I also learned to navigate underwater for a scuba course; we had to swim a triangle, in murky water where we could not see the place we wanted to end at (where we had begun). I could set a compass course using not just N,S,E,W, but specific numbers on the dial. I set off, the sun sails west over North America behind me, the water turns to iron grey with choppy little waves smacking me broadside, a big one every fourth wave; whump whump whump WHUMP whump whump whump WHUMP whump whump whump WHUMP whump whump whump WHUMP. I could not turn the pointy end of the boat into the waves as you are supposed to because I had to stay on course, so the Fin rocked with each wave, but didn't dump me into the night sea. Overhead, the sky was iron scattered with glitter; the entire Milky Way sprawled out unfettered by light pollution. Ahead was a thin line of marsh grass marking the sandbar that is Assateague. To the north, marsh and shallow bay interwove until you couldn't tell where one ended and the other began. It was a fractured puzzle that I could get lost in in the daylight. To the south, lay the rest of Tom's Cove, the channel, the open sea and France. Oh there was Wallop's Island and a NASA base, but their giant telescopes were aimed at the stars, not shipwrecked kayakers. I whump whump whump WHUMPED across the cove, for awhile, following the glare of headlights on the distant beach. Then it was ten and the beach closed and the cars went home. I was alone in the dark. I would stop now and again to check the compass, dropping the paddle on its leash overboard, to wash under the boat, turn on the headlamp, extract the compass, on its own leash, from under the deck bungees, peer at it, figure out which blit on the horizon I was headed for, put the compass back, turn off the headlamp, extract the paddle from under the boat... which by now was pointed toward Wallops and France... yaw the boat back into position and keep paddling. At some point I found a shoal, a tiny sandflat and pulled up on it, dropped anchor and hunched in the cockpit napping. The boat began rocking, as the tide rose, I pulled it up farther, and resumed napping. Boat rocked again, I pulled it up, and was looking at water coming from the other side... I was running out of land. Back in the boat...paddle. Whump whump whump WHUMP. Somewhere, in the midst of the darkest part of the night, a headland to the north drifted past. I had a different view of the woods... and in the middle of it, right at the edge of my vision was a 140' brick tower, built just after the Civil War, painted in red and white candy stripes, with rotating double beacons going blink-blink.....blink-blink.....blink-blink into the night. I have climbed the Assateague Light. I have a gazillion pictures of it, even of the light room itself when they let you climb up in there. I have written stories about it. Now it was actually a navigational aid. Of course the Light can't help you directly. There's no one in it at night, it's automated. But if I kept it at just that spot in my field of vision, I was on the right course. I would not get lost in the marsh or swept out to sea. I had prepared; I had learned the art of kayaking, of preparing for a journey into the backcountry. I knew the island,it's possibilities, its potential dangers. I had the right gear. I was responsible for my journey. But there in the dark, when I needed it most, was a Light. Clearly I survived the journey, I'm writing this. But there are some other fun details like the Parking Ticket of Doom and the Truck that Would Not Start, and The Missing Kayak Blocks From Hell, all of which are in the PFD...er... the PDF, the PFD is in the 'yak bins waiting for the next adventure.